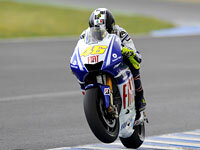 The annual pre-season official MotoGP test event was held at the Jerez Circuit in Spain on March 28 and 29. In the official timed sessions on the second day, the Fiat Yamaha Team riders Valentino Rossi and Jorge Lorenzo were both in fine form, placing 2nd and 4th respectively. 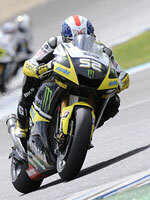 The Monster Yamaha Tech 3 rider Colin Edwards placed 10th and his teammate James Toseland placed 16th due to a fall. Finishing first to take home the prize of a new car was Casey Stoner (Ducati). The traditional season curtain-raiser in Jerez looked in danger of being declared a washout this morning, but the sun eventually came out and allowed Jorge Lorenzo and Valentino Rossi to put in a brilliant afternoon痴 work, finishing first and second respectively. The day痴 results bode well for tomorrow痴 倉ualifying・shoot-out, which will see the fastest rider take home a new car. With all riders now on Bridgestone tyres and qualifying tyres resigned to history, the session will have a slightly different feel to previous years and promises to be an entertaining show. Lorenzo began work quite early, braving a damp track to get some laps in before lunch. Once the track came dry this afternoon he immediately found his rhythm and went on to clock consistently fast laps throughout, finishing well under lap record with a time of 1・9.791. 2008 World Champion Rossi took it easy this morning, preferring to wait until the track had dried out before getting started. He finished the day just 0.070 behind his team-mate and a tenth of a second ahead of Stoner in third, and is confident of putting up a good fight in tomorrow痴 qualifying competition with a few small refinements planned for tomorrow morning. Colin Edwards and James Toseland ended the first day of the penultimate MotoGP winter test session in Jerez with the fifth and 11th fastest times respectively. After a delay caused by heavy early morning rain, Edwards and Toseland were able to complete 140 crucial development laps together on their Monster Yamaha Tech 3 YZR-M1 machines under sunny skies this afternoon. Texan Edwards continued his impressive winter testing form by setting the fifth quickest time as three Yamahas finished in the top five. His best time of 1・0.579 was just 0.007s off fourth position as he gained vital data on Bridgestone tyres on the new Jerez track surface. British rider Toseland had a positive day too, ending 11th on the timesheets. He set a best time of 1・1.122 to finish just 0.073s outside of the top ten, though on his best day yet on the new 2009 YZR-M1, he was consistently running inside the top ten until the closing stages. 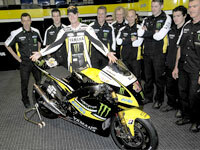 Today痴 session also gave MotoGP fans the first chance to see Toseland and Edwards riding in the new eye-catching Monster Yamaha Tech 3 livery, which was unveiled on the eve of the Jerez test. The first competitive outing of the year, the Official Practice Session in Jerez today, saw Fiat Yamaha riders Valentino Rossi and Jorge Lorenzo finish second and fourth after the 45-minute session was interrupted by a red flag before being cut short by rain. In the first 倉ualifying・session since the single-tyre rule came into play the riders were keen to get a feel for the new system and were disappointed not to be able use the session to the full, but both are nonetheless satisfied with the work they致e done this weekend and are now looking forward to the first race in two weeks time, under the Qatar floodlights. Rossi was third in this morning痴 free practice session, continuing to work on fine-tuning the setting of his M1 at this last test before the season. Lorenzo was even faster, finishing the morning second behind Stoner and the pair were looking forward to a competitive showing this afternoon. A crash from James Toseland with 15 minutes to go saw the red flags come out for five minutes and the delay meant the riders were only able to complete a couple of fast laps before the rain came down and spelled an end to the session, with Casey Stoner fastest after a lap of 1・8.646. Edwards finished 10th quickest overall, the Texan posting his best time of 1’40.305 in the televised 45-minute BMW shootout that was cut short by heavy rainfall. Edwards was less than 0.2s off a top six finish with his main focus spent working on a front-end setting to help him maximise the potential of the Bridgestone front tyre ahead of the first race in Qatar on April 12. The 28-year-old underwent precautionary scans at hospital in Cadiz this afternoon after suffering concussion in the fall, but having been given the all-clear by doctors, Toseland returned to the Jerez paddock later this evening. He will fly home to the UK tomorrow to rest and recuperate ahead of the season痴 opening race under the Losail International Circuit痴 floodlights. * This is the comment for the first day.